The OMR A reader of this blog, who became a real-life pal, and I have been having a long [few years now] conversation about rifle stock design and in the sprit of 'a little less conversation, a little more action please' we made the pilgrimage to Ivythorn Sporting to send a few down range. Our plan was start at the top and work down. A few hearty thumps to the shoulder from the 375 H&H later, and we turned our attentions to the 404 from Sauer. Posh timber aside, these are Sauer's top of the line offerings: 404 XTC and the 404 XT. The 404 is a funny thing, like the Blaser R8 it looks a bit 'space-age laser-gun' in photos, but less so in real life. I wasn't too sure how I felt about the look of it. I'm now convinced it's an ergonomic marvel. Once you shoulder one it's a revelation. Fit to function seen through new eyes. CZ in 375 H&H Yee Gods!! People shoot these things for fun? OMR (One Man Riflemaker) took one very reluctant shot, just to be able to say that he had, I foolishly took five and feeling a little discombobulated gave the rest of the rounds back. Recoil adverse neither of us can afford to slide any further down the rankings at our respective target clubs. I'm sure the 375's perceived recoil is negligible when you're firing at an enraged charging Cape Buffalo for the third time, but at the range? Flinch-Tastic. Rather you than me. OMR and I had taken the precaution of bulking up on pies to absorb recoil. What my daughter calls my 'Wannabe Alaskan' hat and beard combo in full effect. 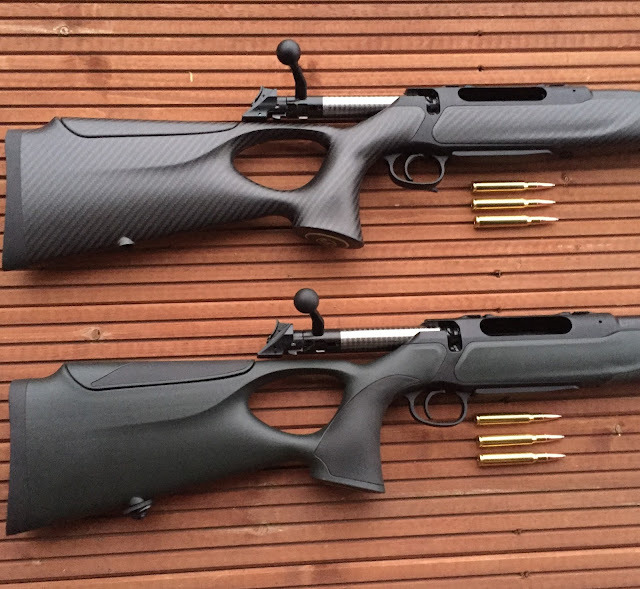 Even a full spec 404 in carbon with the fluted barrel, and no moderator chambered in 30-06 wasn't the hammer blow to the shoulder I was expecting. Shooting rounds in the 6-7mm range, these things must feel like a losely held 22LR. The XT Carbon surprised me too at 2.8 kilograms / 6.1 lbs there's really not a lot to it. I imagine it would make a wonderful Hill Stalking rifle. Steve from Ivythorn let us pour a cup of water over the pistol grip for a 'Cold Wet Hands' test, despite looking as smooth as a smooth thing's smooth bits, it felt every bit as grippy as an oiled walnut stock if not a little more so. There is at least one stock manufacturer claiming that carbon fibre has recoil damping properties, so far my cynicism of this claim is unbounded. Asking about, everyone I've spoken to who has actually laid carbon with their own hands has laughed when I've repeated the claim. One fella went as far as saying 'if you want damping you'd be better off with fibreglass, but that would cost you all the weight-saving you've just spent all that money on, re-think the ergonomics, transmission of energy is key’. During the endless Blaser debates online, all kinds of hilarious objections to their radical design have been raised and disproved. What they all come down to is ‘I want a rifle that looks like a rifle’ Which really means ‘I want the comfort of the familiar’. There's another example from my work life. In the UK the specification for the position of power sockets has changed, they’re now a little higher up the wall above the skirting board, client after client has complained that they don't like the new height, a few months later they all say its actually more convenient. I’m not immune to this myself. When I first started spending time in Spain, I found the light switches counter intuitive, running my hand over the wall in the dark looking for the switch. In the UK we place them where your eye falls, in Spain they’re where your hand falls. Reach out at hand height and there it is. With the 404 XT Sauer have entered a new era of rifle ergonomics, what looks a little strange at first sight feels just right after the first couple of shots. The stock and cheek piece are only the start of their plan to make a rifle tuned by the individual shooter to the individual shooter. Interesting times. Big shout to Steve at Ivythorn Sporting for letting us put our sticky fingers all over this stock[s] and use his range. If you want to test out the 404 or anything else from his enormous choice he does a deal where you can have any of his rifles or shot guns sent to your RFD no obligation or if you're within range of Somerset you can try before you buy. He also serves the best coffee of any gunshop I've ever been to in the UK, the USofA or even Spain.